If you’re ever in Dubai, Wejdan Cafe & Restaurant is a must try. 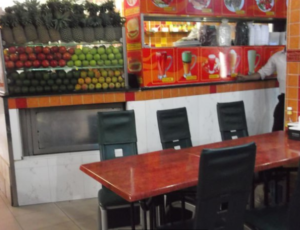 This cafe is situated Near Emirates NBD Bank International, Al Maktoum Road, Al Rigga, Deira, Dubai. This cafe & restaurant isn’t glamorous or extravagant but the food is absolutely scrumptious. 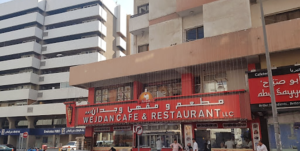 I lived in Deira for a few months & Wejdan Cafe & Restaurant was actually down the road from me. This was my go to place mainly for their shawarma’s. The seating area is quite small to dine in but the staff is always so welcoming whether you’re dining in our taking out. I have dined in once with my family & it was actually really nice. I have tried their Spicy Charcoal Chicken which is divine. It comes with chips (fries), salad, an amazing garlic type sauce & pita bread It was definitely satisfying. 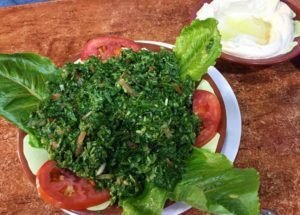 I also had their Tabbouleh & Hummus on the side, that was really tasty, you can taste the freshness in them. As an extra I also had to try their Sliced Shawarma’s, it is super delicious & the presentation is picture perfect. 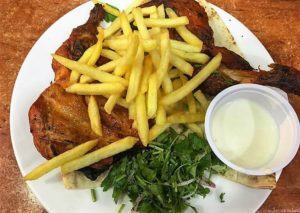 This meal is served with chips (fries) & some of that delicious garlic sauce. 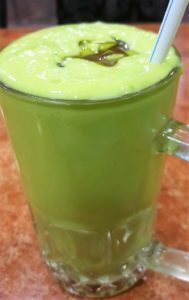 To quench my thirst, I ordered the Avocado fruit juice which is freshly juiced from the raw fruits. There are a variety of fresh juices to choose from. The Avocado drink was not really to my liking, to be honest it tasted like avocado in buttered bread lol – if you’re South African you know that Avocados & buttered bread is a snack that we all have had a try at. 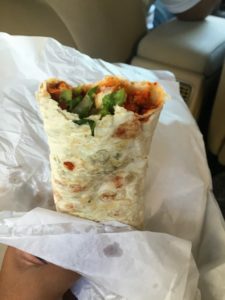 Now I did mention how much I love their Shawarma’s – it’s definitely their signature meal because once you’ve tried it, you will be visiting Dubai especially for them! 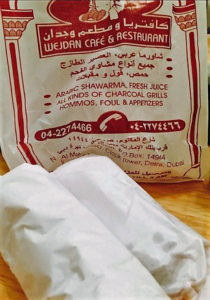 They used to package their Shawarma’s in a white paper & if you’re ordering for take away then you’re most likely to receive them in their branded carrier bags. 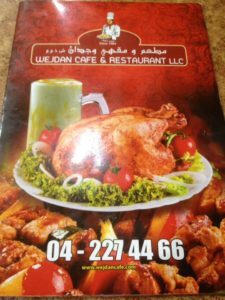 After moving from Deira to Mirdif with my family, we still made trips to Deira during the weekends to stop at Wejdan Cafe & Restaurant. Yes, we actually go there specifically for the Shawarmas’s. During those quick trips, we usually just pick up & go. 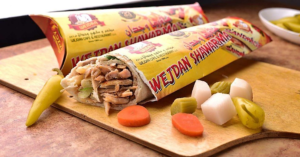 Recently though they have changed the packaging for their Shawarma’s, it does not have the paper wrapping anymore but now a new and improved cardboard wrapping with their branding on it as well. Did I mention that it’s absolutely worth every bite for the price? It used to be 5 DHS (AED) each but after their new packaging, the price changed to 7 DHS (AED). 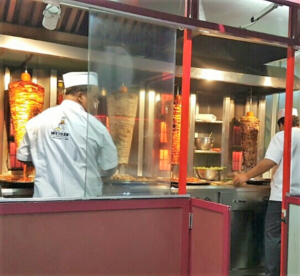 The Shawarma’s are prepared outside on a rotisserie & you can choose between mild & spicy chicken shawarma’s. Their menu is also easy to read with images & descriptions of each dish. 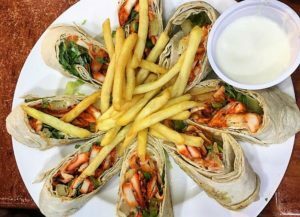 Just keep this place in mind whenever you’re in Dubai because these dishes at Wejdan Cafe & Restaurant are really something worth the travel. If you're ever in Dubai, Wejdan Cafe & Restaurant is a must try. 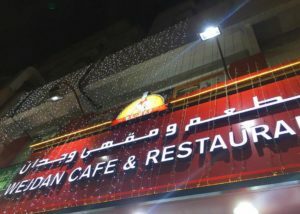 This cafe is situated Near Emirates NBD Bank International, Al Maktoum Road, Al Rigga, Deira, Dubai.